Bout a year ago he was suddenly in my garden, out of blue not planning to leave. 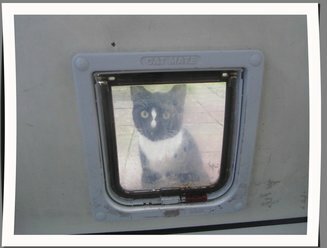 Whenever he heard me he was waiting for me in front of the cat flap. I already got 3 cats so I went looking for his owner but nobody responded to my flyer's or website. After a while I decided he could stay. Went to the vet to get him neutered and his vaccinations and he got a chip. Fons is a lively but a dominant cat but very cuddly and sweet as well. Till now I don't regret he came into my life like Fonzie (from Happy Days) he is totally cool. Every now and than I still wonder what his story is guess I will never know. Note from admin: Click on thumbnail to enlarge picture.